Hello. Hola. Bonjour. Hallo. Ni Hao. I’m Julie from Globe Trottin’ Kids, and I am excited to be guest blogging for Minds in Bloom. Our world has never been more connected, and the need to create opportunities for our youngest students to learn about the world has never been more important. Connecting students globally with diverse literature, current events, projects, and activities will set them on the path to becoming informed, involved, and responsible global citizens. A great way to start the conversation in the elementary classroom is to share What Does it Mean to Be Global? by Rana DiOrio. Kids will discover that being global means being a citizen of the world. Watch the book preview video and find a discussion guide and activities here. Kids need to see themselves and people from their immediate world in the books they read. Fill your room with books that represent your students, your classroom, and your community. Include a variety of genres that introduce world geography and cultures, provide different perspectives, and celebrate diversity. Multicultural Children’s Book Day, held annually on January 27th, focuses on raising awareness for children’s books that celebrate diversity and getting more of these books into classrooms and libraries. 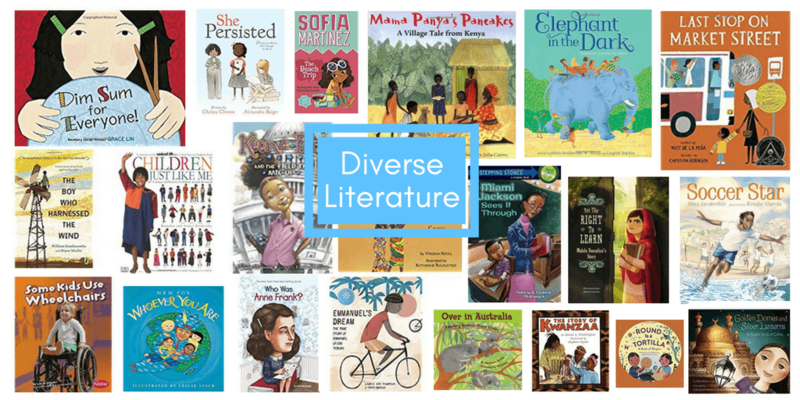 Their Diversity Book Lists for Kids is a great resource for finding books, and their Giant Linky consists of hundreds of book suggestions, reviews, and activities. Dogo News (doh-GOH, means young or small in Swahili) has short format articles for kids on current events, news, and non-fiction content for Common Core ELA, Science, and Social Studies. Find thousands of news articles and new original content added daily. Includes photos, videos, vocabulary word search games, and an option to play the audio and listen to the article. Scholastic’s NEWS for your classroom: daily news and current events for kids, from Scholastic News Online®. This website features news articles, videos, book reviews, surveys, podcasts, interactive games, and more. Global Read Aloud (GRA): One Book to Connect the World. This is a free, once-a-year project in which classrooms around the globe read the same book during a set 6-week period and make global connections through Skype, Twitter chat, Edmodo, Kidblog, or any other way. Even post cards and snail mail will work! The point is to connect. The books change every year and include a picture book study for young students and three other books from which you and your students can choose. The kickoff is October 2, 2017. Australian author Mem Fox is the focus of this year’s picture book study for the youngest readers. It includes Koala Lou, Possum Magic, Whoever You Are, Hattie and the Fox, and Tough Boris. The other books to choose from are Fenway and Hattie by Victoria Coe (early readers); The Wild Robot by Peter Brown (upper elementary/middle grades); A Long Walk to Water by Linda Sue Park (middle school); and A Monster Calls by Patrick Ness (young adult). PenPal Schools: Connecting students (ages 8-18) with pen pals around the world to learn about cultures and global challenges. Each student is matched up with up to three to four pen pals from three to four different classrooms around the world. Weekly lessons consist of watching a video, reading a text, and answering a discussion question. Lessons take about 30-45 minutes to complete and can be completed at any time from any device. Sometimes students work on collaborative projects with their pen pals and share links. Each project is offered at three different levels of difficulty to support a range of abilities. Preview the projects to determine the level that’s best for your students. All projects are aligned to academic standards and include reading, writing, technology, and collaboration skills. Current projects include: VR Field Trip to Pakistan, Joining Forces for the Environment, A World of Food, World Explorer, Immigration, and Flags of the World. Demo a project here. Kids Care Clubs: Supporting kids in getting involved in meaningful service and offering a variety of projects to choose from. Reach Out to Refugees: Many refugees coming to America have few possessions. Help families by collecting items they need. Nothing But Nets: Save lives in Africa by raising money to purchase and donate malaria nets. Malaria kills a child in Africa every 30 seconds. Diversity Quilt: Celebrate diversity in our global community by making a quilt for a person in need. Visit cities, museums, nature, world landmarks, castles, and more using 360-degree interactive panoramas. Each panorama offers factual and historical information with links to additional information. The panoramas are archived and sorted by categories to help you browse the more than 700 panoramas. Children all over the world enjoy playing games like hopscotch, tic-tac-toe, and dominoes. However, the names of the games, how they are played, and the materials they use may be different. This product gives children the opportunity to explore and compare a variety of games from 23 countries. Each game card includes clear instructions to prepare and play the game, its country of origin, and printables when necessary. A perfect resource to use all year long! A preview is available in the link above. Making global connections in the elementary classroom is essential. By providing a variety of opportunities for students to learn about our world and by engaging them in meaningful activities, educators will be developing the skills and attitudes of our next global citizens. Julie Yeros is a National Geographic Certified Educator and the creator of Globe Trottin’ Kids. Their website features an interactive world map that links to country profiles, infographics, maps, photographs, and a variety of global learning resources for students and educators. Browse their store on Teachers Pay Teachers, and connect with them on Pinterest, Twitter, Facebook, and Instagram. * Minds in Bloom, Inc. is a participant in the Amazon Services LLC Associates Program, an affiliate advertising program designed to provide a means for sites to earn advertising fees by advertising and linking to Amazon properties including, but not limited to, amazon.com, endless.com, myhabit.com, smallparts.com, or amazonwireless.com.